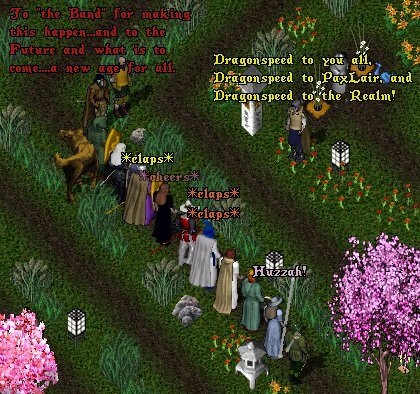 Ultima Online experiences many steps beyond "just playing the game". Learn More about PaxLair and its Community Involvement since 1998. PaxLair-wide Weekly Meetings (Tuesdays, 9 PM U.S. Eastern Time) - See each meeting location listed on the UO Forums Chesapeake Calendar. Directions or a Rune is always provided. This is the best way to meet people of PaxLair and tell them all about yourself. NOTE: Every meeting starts with new and returning player introductions!! Post on the JOIN Thread - Located on the UO Forums-hosted PaxLair In-Char Forum sticky-thread. More information is there to reach various officials via Private Message on UO Forums. Welcome once again and safe travels across the Realm! We hope to see you soon in one of our cities.